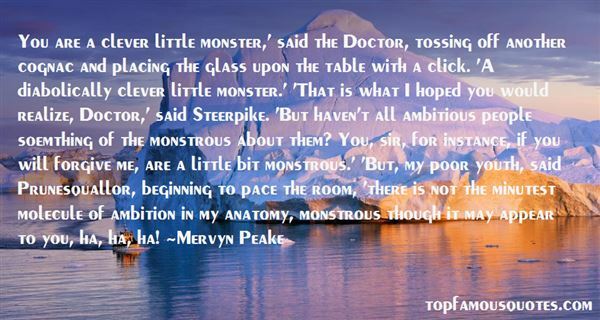 Reading and share top 6 famous quotes and sayings about Steerpike by famous authors and people. Browse top 6 famous quotes and sayings about Steerpike by most favorite authors. 1. "Glorious,' said Steerpike, 'is a dictionary word. We are all imprisoned by the dictionary. We choose out of that vast, paper-walled prison our convicts, the little black printed words, when in truth we need fresh sounds to utter, new enfranchised noises which would produce a new effect. In dead and shackled language, my dears, you *are* glorious, but oh, to give vent to a brand new sounds that might convince you of what I really think of you, as you sit there in your purple splendour, side by side! But no, it is impossible. Life is too fleet for onomatopoeia. Dead words defy me. I can make no sound, dear ladies, that is apt.' 'You could try,' said Clarice. 'We aren't busy.' She smoothed the shining fabric of her dress with her long, lifeless fingers. 'Impossible,' replied the youth, rubbing his chin. 'Quite impossible. Only believe in my admiration for your beauty that will one day be recognized by the whole castle. Meanwhile, preserve all dignity and silent power in your twin bosoms." 2. "Equality,' said Steerpike,' is the thing. It is the only true and central premise from which constructive ideas can radiate freely and be operated without prejudice. Absolute equality of status. Equality of wealth. Equality of power." 3. "The Aunts put their arms about one another so that their faces were cheek to cheek, and from this doublehead they gazed up at Steerpike with a row of four equidistant eyes. There was no reason why there should not have been forty, or four hundred of them. 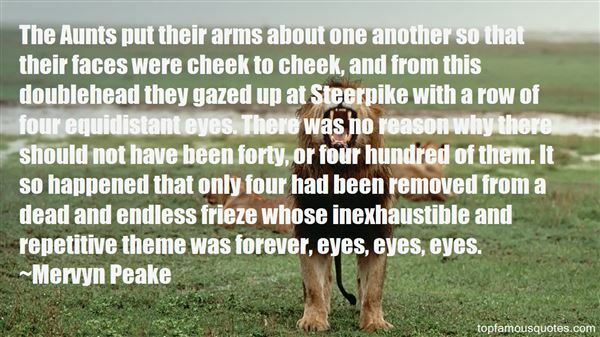 It so happened that only four had been removed from a dead and endless frieze whose inexhaustible and repetitive theme was forever, eyes, eyes, eyes." 4. "You are a clever little monster,' said the Doctor, tossing off another cognac and placing the glass upon the table with a click. 'A diabolically clever little monster.' 'That is what I hoped you would realize, Doctor,' said Steerpike. 'But haven't all ambitious people soemthing of the monstrous about them? You, sir, for instance, if you will forgive me, are a little bit monstrous.' 'But, my poor youth, said Prunesquallor, beginning to pace the room, 'there is not the minutest molecule of ambition in my anatomy, monstrous though it may appear to you, ha, ha, ha!" 5. 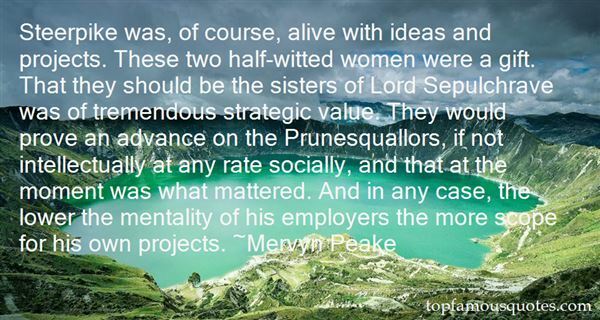 "Steerpike was, of course, alive with ideas and projects. These two half-witted women were a gift. That they should be the sisters of Lord Sepulchrave was of tremendous strategic value. They would prove an advance on the Prunesquallors, if not intellectually at any rate socially, and that at the moment was what mattered. And in any case, the lower the mentality of his employers the more scope for his own projects." 6. "She feels a splash of water on her hand and, turning, sees that the sky has become overcast with a blanket of ominous dark rose-colored cloud, and of a sudden the light fades from the lawn and the cedars.Steerpike, who is on his way back to the Earl's bedroom, stops a moment at a staircase window to see the first decent of the rain. It is falling from the sky in long, upright, and seemingly motionless lines of rosy silver that stand rigidly upon the ground as though there were a million harp strings strung vertically between the solids of earth and sky." We don't do drugs, drink or use profanity. Instead we instill morals and values in my boys by raising them with a love of God and a love and respect for themselves and all people. I believe they will have a chance."